Philips BDL8470QT 84" interactive touchscreen display is an ideal platform for collaborative needs of classrooms or businesses. It features state-of-the-art IR touch and 10-point multi-touch technology that will bring a whole new level of interactivity in business or a classroom. With the help of this amazing technology, teachers and students can collaborate with each other at the same time over a single display. The highly efficient and appealing interactive touchscreen display offers a huge screen size of 84” with UHD 4k (3840 x 2160) resolution and a wide-viewing angle. All these features offered by Philips BDL8470QT 84" interactive touchscreen display, ensure life-like visuals with enhanced image clarity from all corners of the room. Not only this but the amazing integrated software FailOver and SmartCMS will make users life a breeze. The Philips 84" interactive display is full-fledged platform that will transform any environment into a digital and collaborative one. With the brilliant IR touch technology, you can experience quick response time with incredible touch accuracy. This technology eliminates the “ghost points” and allows easy touch operations with a finger, glove or a stylus. The BDL8470QT 84" interactive touchscreen brings effective communications tools such as 10-point multi-touch operation that saves a lot of time and promote interactivity. 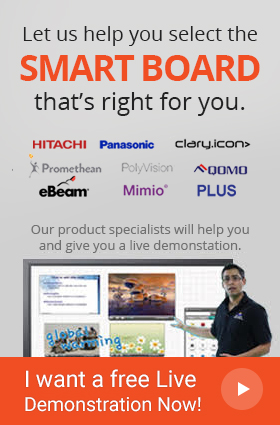 The SmartCMD is an exclusive software offered by Philips that helps you manage content over the interactive displays. This amazing software allows users to create, design and schedule content with ultimate efficiency. With the integration of the FailOver tool, the fear of keeping the content up and running has now been superseded. If the customer is in the middle of a task for example playing the primary media source and suddenly faces a power or any other kind of failure then this is where this tool manages. As it already has created backup of the primary media source and in a situation like this the backup source is played to prevent loss. The overall purpose of the FailOver feature is to provide users with worry-free and intuitive tools to manage the content during presentations. When buying an interactive display, quality is the main concern but not anymore as the BDL8470QT 84" is specially designed for critical applications in different environments. It has a weight of 216 lbs. and the four carrying handles make it easy for users to carry and transport. Installation is made easy with the Smart Insert feature. Also the BDL8470QT 84" interactive touchscreen can save energy up to 50%, thanks to the revolutionary feature SmartPower. 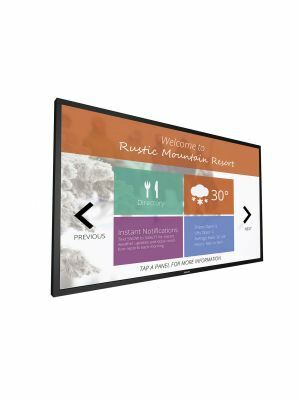 All these features make this interactive touchscreen display a cost-efficient product with durable components. 43.7" x 75.8" x 3.7"
Q. Where can I get the User Manual for my BDL8470QT 84" interactive touchscreen display? A. You can get the User Manual by clicking at the “VIDEOS/RESOURCES” tab right next to the “SPECIFICATIONS” tab. Q. I can see a picture but no sound? A. Please check if sound is muted? Or if the volume is set to minimum and check if the audio cables are properly connected. Q. What video formats do the BDL8470QT 84" interactive touchscreen display supports? Q. Does the Philips BDL8470QT 84" interactive touchscreen display comes with a warranty? A. Yes, the BDL8470QT 84" interactive touchscreen display comes with a standard 3-year limited warranty. Q. Can I use the interactive touch panel display with a gloved hand? A. Yes, the infrared touch screen technology works with a gloved hand. Q. 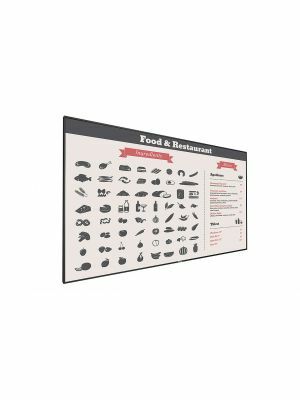 Can I connect a USB drive with the interactive panel? A. Yes, there are three USB ports at the rear side of the interactive panel display.